A Longleaf Pine showing the effects of drought. Although we all know that trees need water, scientists are still discovering new information and implications about the process that allows trees to “drink.” Thanks to recent scientific research, we now have a greater insight into the mechanism of tree death from drought and a new appreciation of how vulnerable trees are. Trees draw water through their roots and into the thread-like channels of their vascular system that distributes it to their most remote needles and leaves. In order to photosynthesize and grow, trees need to open the stomata (pores) on their leaves to take in carbon dioxide. As they do this, water evaporates. The water loss creates a suction effect that goes down all the way to the roots, where the water is replenished, similar to drinking through a straw. When water is unavailable, this suction pressure increases, and air is drawn in. The air bubbles clog the channels and make it harder for a tree to get fluid to its leaves – like drinking from a broken straw. This “hydraulic failure” is the reason trees die from drought. In addition to hydraulic failure, drought can impact a tree’s ability to open its stomata. Even when water is again available, some leaves are unable (or slow) to return to their work of photosynthesis, causing further dieback. Dr. Brendan Choat from the University of Western Sydney and Dr. Steven Jansen from Ulm University in Germany lead a team of scientists that have studied hydraulic failure in trees worldwide. The results of their research show that about 70% of tree species have very little margin in the amount of drought they can endure before they experience hydraulic failure. Surprisingly, this was true for species that grow in marsh as well as desert. The implications of this research are that a small change in the drought level of an area could have serious consequences for large numbers of trees. Watering trees in times of drought is extremely important. Even the largest tree typically has its roots concentrated within the top 12” of soil. They have no ability to suddenly find water when that layer is dry. 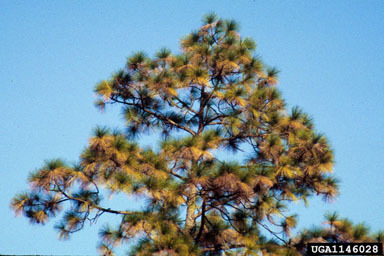 Trees will respond to drought by dropping leaves or needles, and then having whole branches die. The damage can be irreversible. Sophisticated systems are now available to monitor the moisture content of soil and automatically adjust watering to the appropriate level for plants, lawns or trees. These irrigation systems are now common in arid regions and have been found to reduce total water consumption. Giving trees the right amount of water at the right time can prevent hydraulic failure and also prevent the unnecessary waste of water in landscapes by up to 60%. I believe we’ll see this technology introduced in the northeast over the next decade as water for our landscapes becomes a more precious commodity.